Attention: Please upgrade to the latest version of twilio.js to avoid upcoming breaking changes in Google Chrome. See this advisory for details. TwiML App SID The TwiML application with a voice URL configured to access your server running this app - create one in the console here. 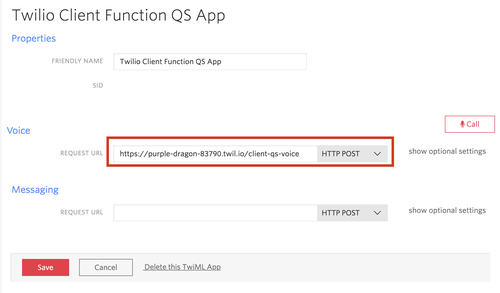 Also, you will need to configure the Voice "REQUEST URL" on the TwiML app to point to a Twilio function you will create. We'll use this code a little bit later, after we get the Twilio Functions set up. You'll need to change the location of a URL in public/quickstart.js to point to your function. Functions is Twilio's serverless code execution environment that lets you write Node.js code that can respond to Twilio webhooks or to regular HTTP POST or GET requests. You can also always write your own server code using any of Twilio's supported server side languages (Node.js, Python, Ruby, C#, Java, or PHP) - check out how to create capability tokens. NOTE: You should not use Twilio Functions to generate capability tokens for your app in production. Each function has a publicly accessible URL which a malicious actor could use to obtain tokens for your app and abuse them. See the section on capability tokens below to learn how to generate capability tokens in your own C#, Java, Node.js, PHP, Python, or Ruby application. To get you up and running with this quickstart, you can use a template to create your functions. Start by going to the Functions page in the Twilio Console. You can add new functions with the plus button on that screen. 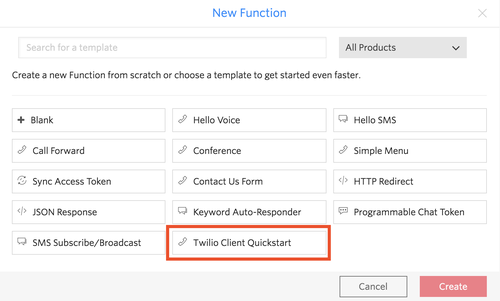 Click that Twilio Client Quickstart template button, and then you can configure your functions - while most of these templates only create one function, the template we use for this quickstart creates two functions - one to provide capability tokens to your Twilio Client, and one to provide TwiML via a webhook. After selecting the Twilio Client Quickstart template, you'll be asked to configure your function with two values - the TWIML_APP_SID and the CALLER_ID. If you didn't set those up earlier in this quickstart, go back and do it now - you'll need both of these values to continue with the setup process. We need to tell Twilio what to do with incoming voice requests for that TwiML app. Twilio will fire off a webhook to your function, but we need to supply that URL in the Twilio console before it will work. Now, configure the Voice "REQUEST URL" on your TwiML App to use the Voice Calls function. Under Voice, set the Request URL to your function's URL, and then click Save. Replace the placeholder (YOUR_FUNCTION_SUBDOMAIN_HERE) with your Twilio Function subdomain, and then save the file. Of course, if you want to see what is going on behind the scenes, take a quick peek at the source while you're there! All set! Let's go ahead and spin this quickstart up. Our back end logic for the application is all running on Twilio Functions, but to use Twilio Client, you will need to run the front end from a web server on your computer. Just opening the HTML page up in your browser (as a file:// URL) won't work in Google's Chrome web browser, for instance. Luckily, you don't need to set up a complicated development environment - you just need to serve static files off of your computer. We recommend the http-server Node.js module. If you don't have Node.js installed on your computer, download Node for your operating system first, and follow the directions to set it up - it's pretty easy! Your web site will be running at http://localhost:8080/ - go ahead and try it out! Be sure to use Chrome, Firefox, or a recent version of Safari. Twilio supports six languages for creating capability tokens (Java, C#, Node.js, Ruby, Python, and PHP). The following code listing has examples for each of these languages. Need some extra help with the Client? Tweet at us or contact support and we'll get you running quickly. Have some fun with Twilio Client in the browser, and make sure to let us know what you're building!